John O’Brien designed terrazzo paving areas and porcelain enamel steel panels for station platforms. Artwork designs incorporate images taken from high altitude aerial photos and from landsat satellite sources. 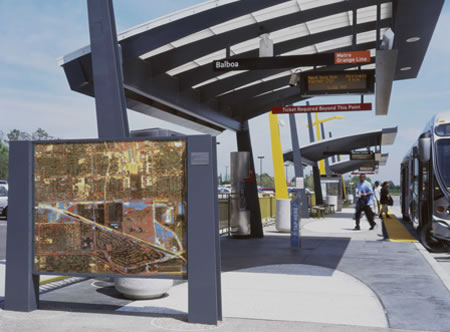 A person in transit can either enjoy the artwork from the purely decorative point of view or delve into its mapping and discover that it actually maps the area they are transiting through. 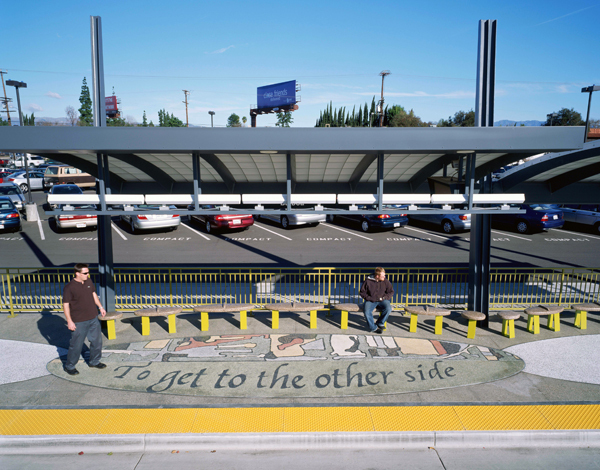 John O’Brien’s public art commissions in Los Angeles include the Mar Vista and Westwood Branch Libraries, Sepulveda Park West as well as the Los Angeles Riverfront Park. He has a Master of Fine Arts from the University of Southern California, and currently teaches as Assistant Professor in Sculpture at California State University Northridge. He has years of experience as an artist/educator and fabricator with a special focus on the traditions of assemblage art and large sculpture.